Join us on Thursday, 13th September to meet our expert panel and take part in a lively discussion on gender and tourism. It’s a great opportunity to hear from an impressive range of academic and industry experts, and to participate in an important debate on the future of women’s rights and empowerment in the tourism industry. 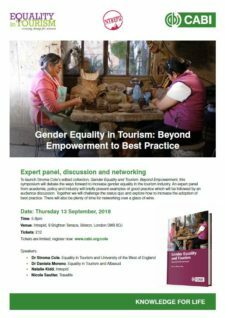 To launch Stroma Cole’s edited collection, Gender Equality and Tourism: Beyond Empowerment, this symposium will debate the ways forward to increase gender equality in the tourism industry. An expert panel from academia, policy and industry will briefly present examples of good practice which will be followed by an audience discussion. Speakers include Dr Stroma Cole (Equality in Tourism and University of the West of England), Dr Daniela Moreno Alarcon (Equality in Tourism and Albasud), Natalie Kidd (Intrepid) and Nicole Sautter (Travelife). Together we will challenge the status quo and explore how to increase the adoption of best practice. As with any good event, there will also be plenty of time for networking over a glass of wine. Tickets cost £12 and are strictly limited, so don’t wait. Buy yours today at www.cabi.org/cole and join us for a thought-provoking evening on Thursday, the 13th of September.